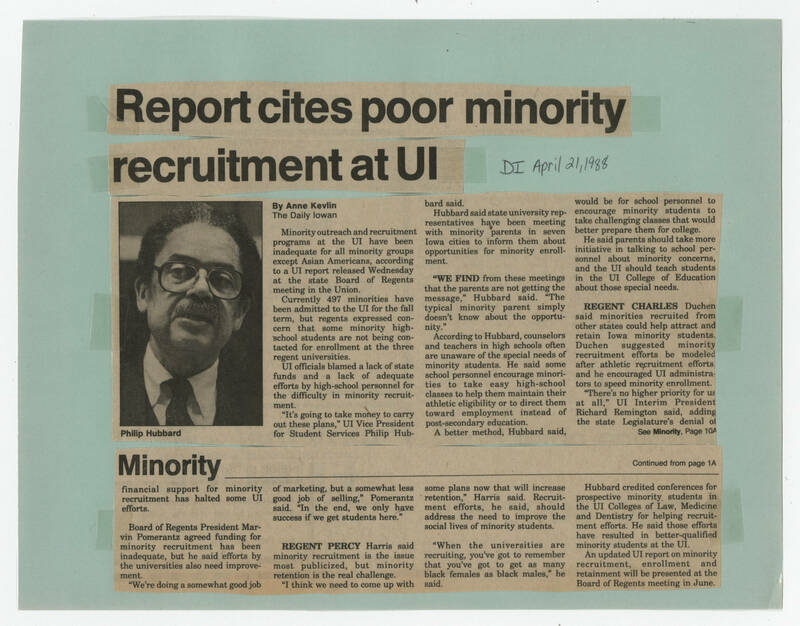 [[Header]] Report cites poor minority recruitment at UI [[end header[[ [[Handwriting]] DI April 21, 1988 [[end handwriting]] [[bold]] By Anne Kevlin [[end bold]] The Daily Iowan [[Photo caption]] [[bold]] Philip Hubbard [[end bold]] [[Article text]] Minority outreach and recruitment programs at the UI have been inadequate for all minority groups except Asian Americans, according to a UI report released Wednesday at the state Board of Regents meeting in the Union. Currently 497 minorities have been admitted to the UI for the fall term, but regents expressed concern that some minority high-school students are not being contacted for enrollment at the three regent universities. UI officials blamed a lack of state funds and a lack of adequate efforts by high-school personnel for the difficulty in minority recruitment. "It's going to take money to carry out these plans," UI Vice President for Student Services Philip Hubbard said. Hubbard said state university representatives have been meeting with minority parents in seven Iowa cities to inform them about opportunities for enrollment. [[bold]]"WE FIND[[end bold]] from these meetings that the parents are not getting the message," Hubbard said. "The typical minority parent simply doesn't know about the opportunity." According to Hubbard, counselors and teachers in high schools often are unaware of the special needs of minority students. he said some school personnel encourage minorities to take easy high-school classes to help them maintain their athletic eligibility or to direct them toward employment instead of post-secondary education. A better method, Hubbard said, would be for school personnel to encourage minority students to take challenging classes that would better prepare them for college. He said parents should take more initiative in talking to school personnel about minority concerns, and the UI should teach students in the UI College of Education about those special needs. [[bold]]REGENT CHARLES[[end bold]] Duchen said minorities recruited from other states could help attract and retain Iowa minority students. Duchen suggested minority recruitment efforts be modeled after athletic recruitment efforts and he encouraged UI administrators to speed minority enrollment. "There's no higher priority for us at all," UI Interim President Richard Remington said, adding the state Legislature's denial of See [[bold]]Minority[[endbold]], Page 10A [[Header]] Minority]] [[end header]] continued from page 1A [[Article text]] financial support for minority recruitment has halted some UI efforts. Board of Regents President Marvin Pomerantz agreed funding for minority recruitment has been inadequate, but he said efforts by the universities also need improvement. "We're doing a somewhat good job of marketing, but a somewhat less good job of selling," Pomerantz said. "In the end, we only have success if we get students here." [[bold]]REGENT PERCY[[end bold]] Harris said minority recruitment is the issue most publicized, but minority retention is the real challenge. "I think we need to come up with some plans now that will increase retention," Harris said. Recruitment efforts, he said, should address the need to improve the social lives of minority students. "When the universities are recruiting, you've got to remember that you've got to get as many black females as males," he said. Hubbard credited conferences for prospective minority students in the UI Colleges of Law, medicine and Dentistry for helping recruitment efforts. He said those efforts have resulted in better-qualified minority students at the UI. An updated UI report on minority recruitment, enrollment and retainment will be presented at the Board of Regents meeting in June.